Cesar Romero opera clown costume worn as "The Joker" in Batman. 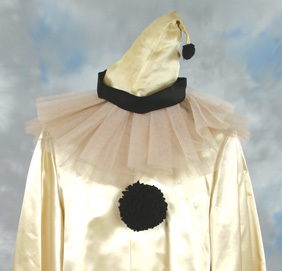 (ABC-TV, 1966-68) This fantastic costume ensemble consists of a long champagne satin tunic with applied black pompom "buttons" along the front, matching billowing pants, a clown's ruff made of beige netting, and a cone-shaped clown's hat with a single black pompom. 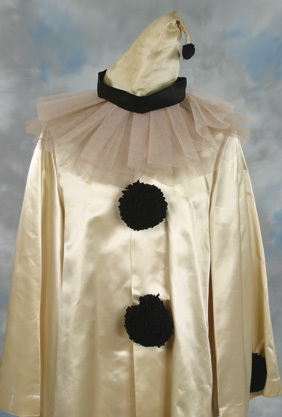 Designed to resemble the tragic clown "Pagliacci" from Leoncavallo's famous opera, this costume was worn by Cesar Romero in the first season Batman episode, "The Joker is Wild" (originally aired on January 26, 1966). Vintage villain costumes from Batman are quite rare, and this exceptional piece is very desirable as a signature "Joker" costume.